so on which platform have to created this?? So you can explain me,how to build this editor?? 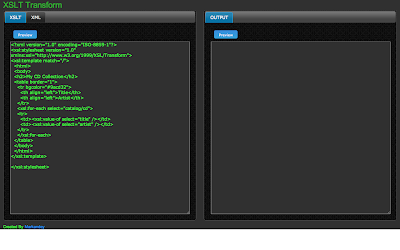 @druv Its all client side code , just view source and u can see everything. btw the UI is just jquery Tabs and layout is done by YUI CSS grids, and simple xslt transformation code is written to generate the output. I am not using any XML here, so might be this is because of it, but I am not sure. This is a useful tool. A bonus would be to put a link on the XSLT editor page with some "about" or "FAQ" info. It's not trivial to find this blog post if someone gave a link to the XSLT editor (see for example http://stackoverflow.com/a/13723638/423105). Useful information would include: what XSLT processor is being used. and also, "What do the different preview buttons do?" They (preview buttons) basically render the xml in browser. browsers normally show a line number if xml is broken. So, its useful to catch error in the XML file is there are any..
at the bottom of page i have link to my blog , i guess that will help people to reach me ..